There is a responsible way to lease for oil and gas; a way to help mitigate the impacts we've seen in places like Yellowstone County, The Gulf, Pinedale, and Prince William Sound. It's nucleus is formed by a little program instituted in the 1960's. It's called the Land and Water Conservation Fund, and it is intended to keep habitat in ample supply, and put hunters in the field. The concept is simple: Take some of the revenue from offshore leasing for oil and gas (drill, baby, drill) and put it into a fund that state fish and game agencies can use to help restore damaged habitat, purchase critical habitat, enter in to conservation easements with private landowners (on a willing seller, willing buyer scenario, of course) and about 1.5% of it should go to ensuring public access to public land. It also allows for the purchase and construction of Fishing Access sites (Most of MT's FAS's are in part purchased with LWCF dollars.) and the acquisition and development of City Parks, trails and other outdoor activities. If fully funded, the LWCF would sit at $900 million per year. That's $6 million per year for access to land locked public lands. According to statistics released in 1992, that was about 50 million Acres. Let me say that again: In 1992, according to the General Accounting Office, 50 million acres of public land was inaccessible by the public. Given the constant battle to simply keep roads open across private land that lead to public land, that number has either stayed the same (due to LWCF funding) or grown. Sounds pretty danged good, right? Forward thinking, substantial government programs that help put critters in the field, that are sustainable, and even generates revenue and puts people to work (How many construction jobs do you think are tied to FAS's, developing city parks, etc?) surely is as American as Mom and Apple Pie. Now, everybody knows that the country is in dire straits. Kids are lining up by the hundreds of thousands for free school supplies, millionaires have to take commercial flights. Everyone is suffering. So, hunters and anglers were expecting to take a fair share of the burden (that's what we do, remember? We're the only user group who fully funds the conservation of wildlife in this nation). However, the House Appropriations Subcommittee on Natural Resources decided that these programs didn't matter. 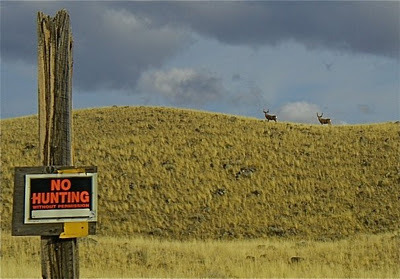 Hunting and Angling groups around Montana and the nation took lawmakers to task for that vote. $15 billion is subsidies and tax breaks for oil companies? That was untouched. $450 million for Sportsmen, kids and local communities? Goddamned Communism; that's what that is. Seriously though, the funds spent through the LWCF play an important part in keeping hunters in the woods. Acquisitions like the Stimson Lumber Land outside of Troy, MT, and the Tenderfoot acquisition would help maintain traditional access to private lands, and conserve critical elk and deer habitats. No taxpayer dollars involved here folks, not a cent. LWCF should not be touched by the politicians, as I've said before, the ethical hunter/angler/conservationist are the only groups that seems to pay their own way. Don't forget the trillion dollars due to the W. Bush taxcuts that were greatly appreciated by the superwealthy, the two wars, that is another two trillion and don't forget the landmark prescription drug bill written by large pharma, that is another trillion that is about 40% overpriced. Class warfare, give me a break. Every ethical hunter and angler in this country should be screaming bloody murder over the plundering of LWCF meant for us, and access is about us. Habitat...Habitat...Habitat Access...Access...Access. JW Westman An ordinary Montanan who does understand what is going on. Get involved, please!! !